112 - April 25th, 2019 PennysaverPlus.com The Purpose of this Report is to Inform You of the Recent Sales in Your Area: I hope you fifi nd this information useful. If at any time you need a Real Estate Professional, Please feel free to contact me. 1. 19 Hermart Ln, Lake Ronkonkoma 11779 $630,000 Colonial 2. 1141 Old Nichols Rd, Ronkonkoma 11779 $540,000 Colonial 3. 11 Ardito Ct, Lake Ronkonkoma 11779 $435,000 Colonial 4. 131 Breeze Ave, Ronkonkoma 11779 $429,000 Raised Ranch 5. 3 Jay Pl, Lake Ronkonkoma 11779 $427,000 Colonial 6. 54 Ackerly Ln, Ronkonkoma 11779 $425,000 Exp Cape 7. 95 Pamlico Ave, Ronkonkoma 11779 $422,500 Hi Ranch 8. 22 Lakewood Rd., Lake Ronkonkoma 11779 $405,000 Colonial 9. 32 Gregory Dr, Lake Ronkonkoma 11779 $373,000 Ranch 10. 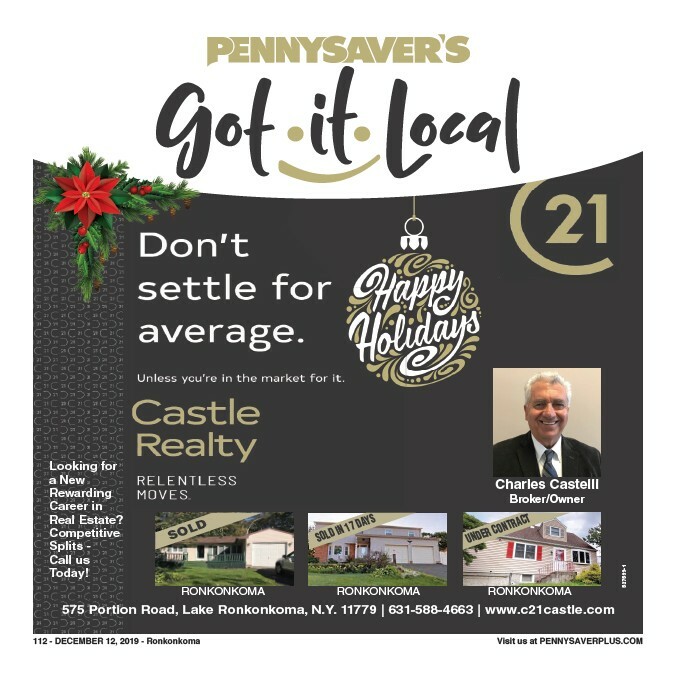 2728 Cedar Ave, Ronkonkoma 11779 $370,000 Ranch 11. 412 Croaton St, Ronkonkoma 11779 $370,000 Hi Ranch 12. 8 Cleary Rd, Lake Ronkonkoma 11779 $365,000 Ranch 13. 255 N 4th St, Ronkonkoma 11779 $345,000 Cape 14. 10 Dorchester Rd, Ronkonkoma 11779 $340,000 Colonial 15. 388 Fir Grove Rd, Ronkonkoma 11779 $330,000 Ranch 16. 2824 Ocean Ave, Ronkonkoma 11779 $315,000 Ranch 17. 16 Carol Dr, Ronkonkoma 11779 $299,900 Ranch 18. 342 Victory Dr, Ronkonkoma 11779 $254,000 2 Story 19. 208 Iroquois St, Ronkonkoma 11779 $216,500 Ranch 20. 105 Patchogue Holbrook Rd, Lake Ronkonkoma 11779 $150,000 Cape Low Inventory Brings HIGHER PRICES! ELAINE HALPIN Licensed Real Estate Associate Broker 631-926-3680 Cell 1ehalpin@gmail.com elaine.halpin@elliman.com Elaine Halpin Realtor @ Douglas Elliman Real Estate If your property is currently listed, please disregard this notice. 467879-1 CALL TODAY! FOR A FREE MARKET ANALYSIS TO FIND OUT THE VALUE OF YOUR HOME! !